ZTreeWin is a fast and flexible text-mode file/directory manager for all versions of Windows. 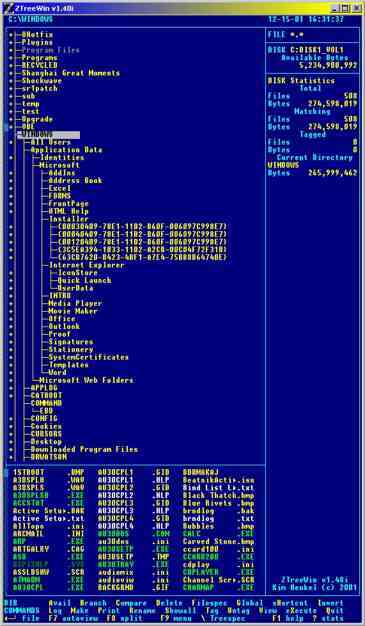 It has been developed as the successor to the legendary DOS file-manager XTreeGold. Anyone who has used that remarkable program would be aware of its superior capabilities as a text-mode, tree-structured file-manager - but would also likely be aware that its limited memory support, and lack of long filename support are today a major issue. ZTreeWin is available in two versions: v2 for Windows NT, 2000, XP, Vista, 7,8 & 10 (both 32-bit and 64-bit), and v1 for Windows 95, 98 & ME. 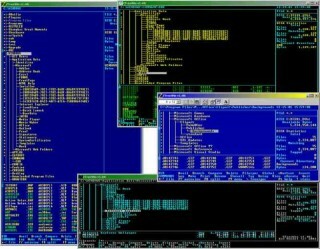 Despite its DOS-like appearance, ZTreeWin is a native Windows application that works easily and efficiently with modern 32-bit and 64-bit operating systems, and in fact, does not run in DOS! The now-standard "tree-structured" hierarchy of directories, invented by XTree, is displayed in the top left corner, the files contained in the highlighted directory listed below left, disk and file statistics on the right side, and keyboard-command menus at the bottom. And ZTreeWin retains the fast keyboard-command text-mode response that XTree pioneered and file management professionals still demand. ZTreeWin also adds many other sophisticated tools, such as case-specific renaming functions, copy & paste facilities, and file type coloring, that are not only possible but essential to modern 32-bit and 64-bit systems. ZTreeWin is a true 32-bit/64-bit application that makes use of that environment to bring best-in-class, high performance keyboard-command text-mode file management to the demanding professional level. It's all about productivity! ZTreeWin provides fast, mnemonic access to all commonly needed file-management tasks, as well as unlimited command history, and macro recording and playback. Any task you do with ZTreeWin can be made extremely easy to do again in the future. ZTreeWin is becoming the most productive, vibrant, and growing disk and file management utility by addressing the needs of today's professionals with a very responsive dialog and development effort while building on well established and time-proven methods and procedures.